I love horror novels based on urban legends, though in the case of The Hollow Tree, I only found out that it was inspired by a local myth in the author’s hometown after I finished the book. In his afterword, James Brogden describes the real life 1944 discovery of a woman’s skeleton inside the trunk of a hollow elm in Hagley Wood, Worchestershire, England. Her real identity was never discovered—and neither were her murderer’s—before the remains mysteriously went missing, and subsequently, a graffiti message appearing on a nearby wall reading “Who put Bella in the Wych Elm” soon solidified the legend behind the investigation. Fascinated, I went to do some more reading on the topic, and was chilled by what I found out. Unsolved crimes and mysteries tend to have that effect on me, and when it comes to the details behind “Wych Elm Bella”, I could certainly understand why the case would be a treasure trove of ideas for a horror writer. For the purposes of this novel, the “Bella in the Wych Elm” legend has been changed to “Mary in the Hollow Oak”, though a lot of its other story elements have remained the same. I don’t really want to elaborate on how Rachel’s role relates to Mary’s fate in case I accidentally reveal too much, but suffice to say, the two women’s lives will be forever entwined because of Rachel’s connection to that “other place”. To me, The Hollow Tree feels very much like a story told in several distinct parts. The first third of the book is a very good character study of Rachel. We’re along for the ride when she and her husband Tom go on that fateful boating trip that turns both their lives upside down, and the accident is as terrible as you would expect. I really felt for Rachel, who now must face her new reality of living without her left hand, but her determination and courageous attitude soon endeared me to her. I admired her a lot for her optimism, but at the same time, her struggles were portrayed realistically. Sometimes, memories of the incident would drag Rachel into a dark place, but those are also the moments in which her character felt the most genuine, with her true nature shining through as she resolutely refuses to wallow in her self-pity or to blame anyone for her problems. In fact, much of the suspense in this book stems from the fact that Rachel is so independent, always opting to tackle conflicts head on by herself, and that defiant streak often leaves her alone in many frightening situations. For the rest of the book, however, my feelings were a bit more mixed. Sometimes, when too much is revealed too early on or all at once, a story can lose much of its mystique, and I think this is what happened here. Rachel’s nightmares and visions kept me intrigued for much of the first third; the ambiguity made me wonder if there was truly a supernatural explanation for all of the things she was seeing and dreaming, or perhaps they were simply the delusions of the protagonist’s stressed mind. So when all was revealed in the second third, it almost felt like the suspense was shattered too soon. In a way, it was like being able to see behind a magician’s tricks, removing all sense of wonder and mystery. While there was still plenty of action and danger to follow, sadly the story never quite managed to regain its foreboding atmosphere and eeriness, becoming a lot more like a straightforward paranormal thriller. Since I had been expecting a lot more horror, this made me feel slightly disappointed. As a result, the later parts of the book took me a lot longer to read, because I just didn’t feel as invested in those sections of the story as I did in the first third. However, I won’t deny I found the ideas behind the novel intriguing, and I still loved the fact that it was inspired by a such a fascinating urban legend. 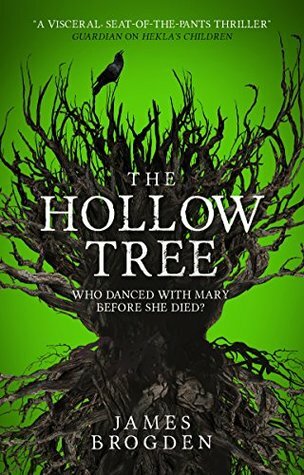 While it’s true that the book could have been a lot more atmospheric and disturbing, ultimately I think The Hollow Tree would make a pretty good choice for fans of paranormal suspense and light horror. What a strange unsolved mystery. I must go and read up about it too. This sounds like a good book so it’s a shame that the mystery was revealed too soon. The urban myth of Bella in the Wych Elm is actually really cool, I’m glad this book introduced me to it. THat’s interesting that it’s related to a local legend. It’s always something intriguing. And it’s an urban legend local to the author too, so it was really neat to read how he incorporated some of the real details! I love stories based on true legends, but it sounds like a misstep, revealing the answers too quickly. It just felt like a story told in multiple parts. The first part was definitely my favorite – it had more of a horror atmosphere, whereas the later parts read more like a paranormal thriller once the other world was “explained”. I think you and I have similar tastes in horror. I’m definitely more about the suspense and atmosphere too. You’ll probably like the first half of the book, but as soon as the explanations are out in the open, the book switches to a straight-up thriller. Oh man, I love unsolved mysteries. I feel like I need to check out the case this is based on. Oh. I thought it would be full on horror. The urban legend does sound interesting though. I read his other book, Hekla’s Children and that was a wonderful mix of many things too. I’m quite intrigued by this because i like the way he writes, but also had the same issue with the other book, how the story suddenly changed direction and some of the mystery was lost and even the genre seemed different between parts of the book. Ah, interesting…thanks for your insight on Hekla’s Children because I had been wondering about that one! I’ve seen this book on a couple of blogs. I don’t think it would suit me but I like the idea and it being based on urban legend. I had originally planned on buying this one but I saw my local library got a copy. I’m really intrigued so I’ll just grab that one. That way if it doesn’t work for me, I don’t feel like I’ve wasted my hard-earned money. Yeah, library would be the best way to go for this one!